The tide turns… Topalov wins again! WCC 2006: The tide turns… Topalov wins again! Veselin Topalov is becoming known as a player who conserves his energy until later phases in a tournament or match. He seems to be following the script after his second win in a row came in only 39 moves. Totally outclassing Vladimir Kramnik, the Brain Games challenger appears a bit sluggish in his play and has not provided much initiative in the eight games played thus far. Topalov stuck with 1.d4 and snared the two bishops early. His opening play shows that the Bulgarian team is far better prepared in this match and after 20 moves, Kramnik's position was already coming undone. 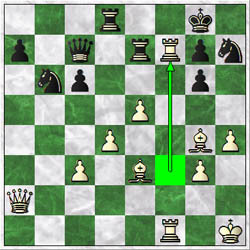 While black shuffled pieces aimless, white mobilized and launched a final assault on the f7-square and Kramnik had to again tip his king. This puts the scores at 5-4 and if Topalov continues his energetic play, he may allay the ill will created by his bellicose manager, Silvio Danailov. There are those who have been jumping back and forth on the controversy and it appears that many sources have lightened the criticism on Topalov. Many believe he is simply playing better chess. However, one cannot ascertain how much effect the controversy has had on Kramnik's play. In coming weeks, more information about the match will reveal itself. Topalov deals crushing blow with 38.Rxf7! Kramnik played a lackluster game and will need to change the momentum of the match.